Man carrying hide boat on his back. 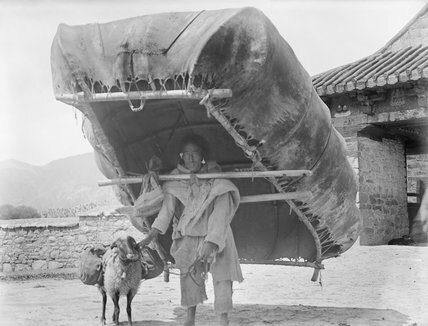 The sheep carries a pair of saddle bags containing his master's barley flour, dried meat, tea, salt, pepper, as well as his eating bowl to provide a cold lunch. Taken just outside the Yuthok Bridge.